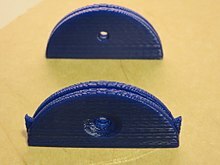 Two 3-D-printed shepherd's whistles, with and without handles. Shepherd's whistles can be more traditionally made from a piece of folded metal. A shepherd's whistle is a specialized, modulatable, variable-pitch whistle used to train and transmit commands to a sheepdog to aid in herding. Unlike other whistles, they are placed inside the mouth and the sound is controlled by the placement of the tongue. Like tin whistles, while simple, they can be used as musical instruments in their own right. A shepherd's whistle is traditionally used for communicating commands to sheepdogs. They are typically seen used at sheepdog trials. Shepherd's whistles are used to communicate clearly and at distances up to several hundred yards the commands of the owner to his working dog. They produce clear, high-frequency tones of an easily modulated and variable pitch, allowing the shepherd to communicate a variety of commands. The pitch is at an optimal frequency for the herding dog's hearing, and for penetration and distance to cut through adverse weather when gathering sheep. There are some standard whistle commands, although the commands in use vary. Oral histories have noted primitive whistles made by of folding over a sheet cut from a tin, a jam lid, or dog-food lid, punching a hole, and smoothing sharp edges. They are also produced commercially. Simple whistles may cost less than 1 USD in bulk; expensive ones may be quite ornate. They are commonly made of plastic, aluminum, stainless steel, silver, brass, titanium, Corian, jade, buffalo horn and other materials. The size of the whistle can vary to fit the mouth of the whistler. The whistle's shape is best described as a flat circle of material, folded in half on a center line. This forms a very narrow U-shape in cross-section. The open space between the two sides is quite narrow - approximately 4–5 mm. A hole is drilled about 5 mm from the fold, through the center line of both faces. The visible faces are then a half-circle shape. The design can also be varied to make the faces squarish, rectangular, or even a triangular A-shape, and handles or a hole for suspending the whistle as a pendant can be added. The whistle position is not at all like that of a standard whistle (diagram). The whistle is pushed into the mouth fold-first. The curved open side of the U is the mouth of the whistle - where the air exits. The lips seal against the outside of the curved edges, such that the inside of the fold can be seen between the lips. The fold is sealed against the tongue when in use. Air travels over the tongue, through the top hole, past the top of the bottom hole, and out of the mouth between the lips. The edge of the hole acts as a fipple. The lower hole opens onto an otherwise closed pocket of air, in the space between the whistle and the bottom of the mouth. This space acts as a sound box; the sound resonates in it. Blowing over the lip of a bottle or jug also makes resonances by blowing across an opening. Unlike typical, single-tone whistles, the shepherd's whistle can emit a range of tones, by using the tongue and mouth to change the shape and size of the "sound box". By moving the tongue and mouth, the resonance, and therefore the sound, can be varied. ^ a b c "A Homemade Whistle in less than a Minute"
^ "Traditional Sheepdog Commands". www.wolfwhistlejewellery.com. Retrieved 2019-03-19. ^ "Whistle Command Sounds and 'How to Use a Sheepdog Whistle'". www.thebordercollie.co.uk. Retrieved 2019-03-19. ^ "Shepherd Whistles for training stock dogs available from Boulder Bluff Inc". boulderbluffinc.com. Retrieved 2019-03-19. ^ "Logan Whistles". www.thebordercollie.co.uk. Retrieved 2019-03-19. This page was last edited on 19 March 2019, at 13:34 (UTC).